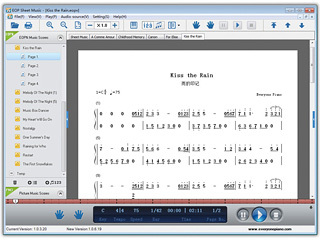 EOP Sheet Music, developed by EOP team, is an all-in-one software with searching, playing and sight-playing staff, as well as bookmarking, printing etc. This is a complete scam. I paid for the membership to download and print music sheets and then was asked to PAY AGAIN. DO NOT USE THIS WEBSITE! I can not understand why you don&apos;t solve the problem instead of making such absurd conclusion. We have lots of VIP members everyone day for many years, no one said need pay for twice. Your MEMBERSHIP do not work maybe caused by a wrong using way or do not activated yet or something else, if you cannot solve it ,you can connect us in email or leave a comment we will help you solve it. I bought the $3 for 300 sheet and I can&apos;t seem to be able to open on EOP, or anywhere relate to this programs. kind of useless. Thanks for your support of EOP, what you buy is a collection of PDF sheets, not for EOP, and if you want to get sheets open in EOP Sheet Music, you can search sheet in EOP Sheet Music, and both sheets or eop files can be seen in it. All basic functions are free, and if you want to print or bookmark sheets you need be a membership. EOP Sheet Music has to write an email to register, then I write my email but nothing at all. I cannot print sheet music and do anything at all. If you want to print sheet music, you need pay for a years membership first, and then write the email you payed for. This is a complete rip off. I paid for the membership and now it wont let me download and save to my computer. I am sorry I cannot get your meaning, why you think it is rip off? What do you want to do with EOP Sheet Music? Only membership can save sheet to their computer, this is a function lots of people want to have, and you do, how comes rip off? If you have any questions, you can connect with us any time you want. If I already paid the basic registration feed, do I need to pay for the music sheets if I download it and save it as PDF? No, what you pay for is a years membership, so in this period, all the sheets in our site is free for you to print or bookmark. If I buy the basic plan, do I need to pay to print out another song? No, what you pay for is years membership, so in this period, all the sheets in our site is free for you to print or bookmark. Can you explain the trouble you met in detail? In which step? 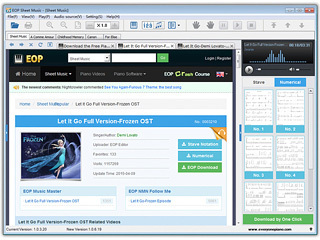 You just need dowload and install it and then search the sheet you want.You can use our EOP Sheet Music to see the sheet, and if you want output a pdf file you need be a EOP member. Click buy now button. Thanks for your support of EOP, if you have any other questions, conncet with us. I can not download until I register, and when I try to register with my e-mail adress it tells me it&apos;s an "error mailbox, Please re-enter"
You need enter the mailbox that you used when you pay for the program. If also cannot work, connect with us. Whenever I click "Download by One Click", "Enter Order Email to Activate Program". And when i entered the email i used to register this account, "Error Mailbox, Please Re-enter!" thingy keeps popping up. I don&apos;t understand. What email must we enter. And after entering that email, we have to click "Activate", right? SOMEBODY PLEASE EXPLAIN ME! You need click buy now first, and after the payment, you can enter the email you used, and then click the activate, thanks for your support first. I am using a mac so I cant get the music. Is it ok to drag the Stave images onto an application like Pages and Print it out? You can open it in a windows pc and print it out. Or if you just want sheets in pic, you can see it on our site, and save with right mouse button, and print it out. "Errors Mailbox, Please Re-enter!" what should i do ? Can you tell us the problem you met in detail? Such as what appears when you click register, or which step have you got in the register process? A wrong email address? a wrong password? or whatelse? 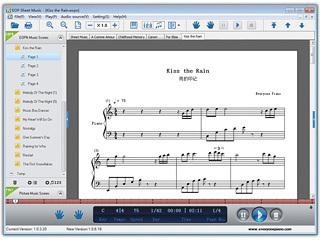 Hello, I can`t activate the eop music sheet program. I,ve already registered, im logged, but still can,t activate the program, it says: error mailbox, please re-enter! what i have to do? You mean when you relog a error shows to you? Or from your first use, it always say error mailbox? You need enter the mailbox that you used when you pay for the program. If also cannot work, connect with us. when I try to run the .exe file on a Windows 8 machine, it says "windows cannot access the specific device, path, or file. You may not have the appropriate permissions to access the item. I even got the error after running as an admin. What should I do? You can try again with compatibility win7 which can be found with right-click to view the properties. If also does not work, tell us the details, we will try our best to help you solve it. hi thx for this great program, can you tell me please how to active EOP ?? it ask me for master E-mail ! !